It was the fall of 2008, the economy was in a tailspin and it was decidedly not a great day for the country, but it was a pivotal day for everything that has happened since... and for us, it will be burned in our memory forever. In the predawn hours of a brisk Monday morning, my son and I woke in a hotel in Grand Junction, Colorado. My beloved 8 year old boy had knocked on doors with me during the historic campaign, and had raised money for a campaign donation with an Obama inspired poster he drew with crayons. So naturally, I allowed him to skip school to be a part of history in person. As a single mom of a young, precocious boy, Obama’s unique personal story already resonated deeply for us. Our eagerness at that pre-dawn hour earned us a spot on the risers right behind Obama for what turned out to be anything BUT an everyday stump speech. It was on that fateful morning on September of 2008 when Lehman Brothers collapsed. And so it was that we heard about this impending chapter in the collapse of the economy -- and of McCain’s tone-deaf words -- in person from Barack Obama himself. It was a legitimate turning point in the election of our lives. And it was the day my son got to meet the future President of the United States. 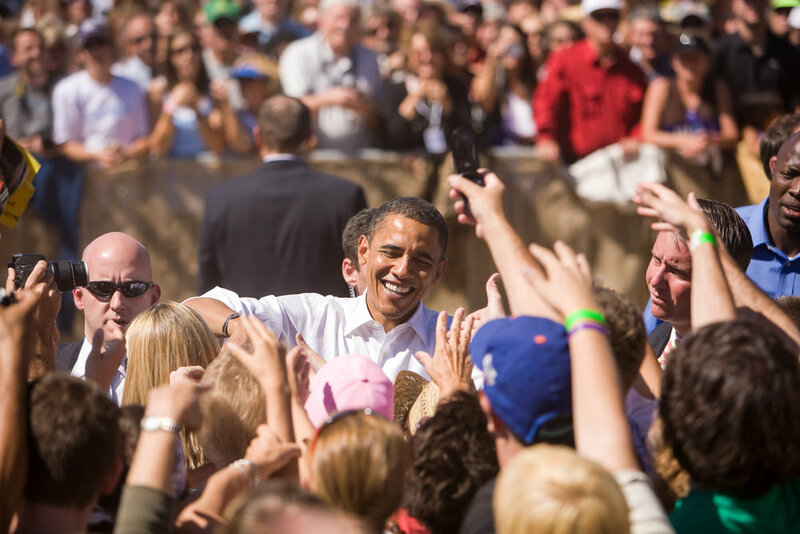 After the speech wrapped up, and after Obama walked the rope line, shaking hands with jubilant and hopeful admirers, one of the volunteers spotted my boy and asked if he wanted to go meet Obama. It was ALL he wanted to do!! And so Harris cleared it with secret service, and walked my 8 year old to go meet Obama and pose for a photo with the volunteers. I witnessed the moment with a sense of pride that is still difficult for me to put into words. I knew in my soul upon hearing him speak that day that he would be elected. His personal presence, his quiet command of respect, his open, infectious smile and his ability to inspire were already qualities that shone brightly. For eight years, my son and I have been moved by his integrity and his example. Our lives have improved dramatically, from our economic livelihood (my entire business was built in the Obama era -- rising tide lifts all boats! ), to our health care, to the feeling of personal empowerment he instilled in us to keep fighting for the things we hold dear: environment, civil rights, and a better life for our fellow citizens and humans around this beautiful planet. Above all, I am grateful that my son came of age with the Obama family as our role models, as our First Family. The leadership, ethical values and high integrity exemplified by Barack, Michelle, Sasha and Malia have meant the world to me as a mother, as a proud citizen and as a human being. Thanks, Obama!! I’m proud to share the planet with you and wish you a love and family filled break… and all the best in your next chapter. 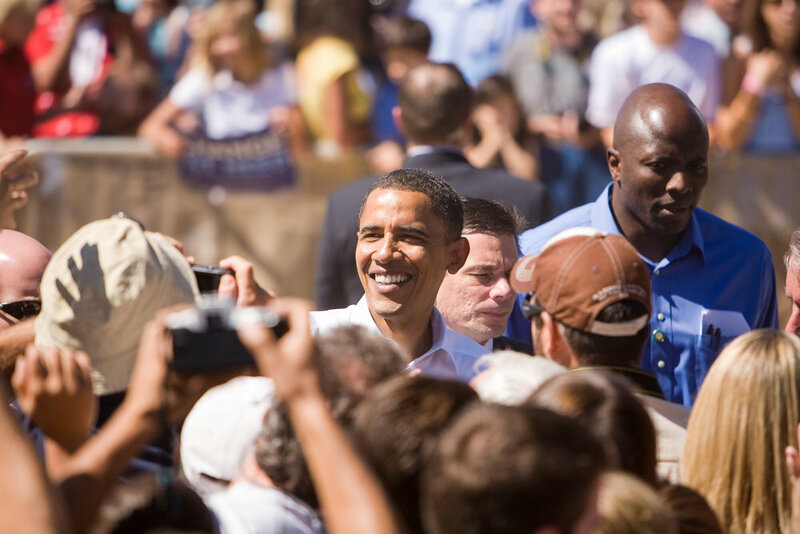 My boy (tiny smiling one, to the right of the photographer) and Obama (to the left of the photographer)!